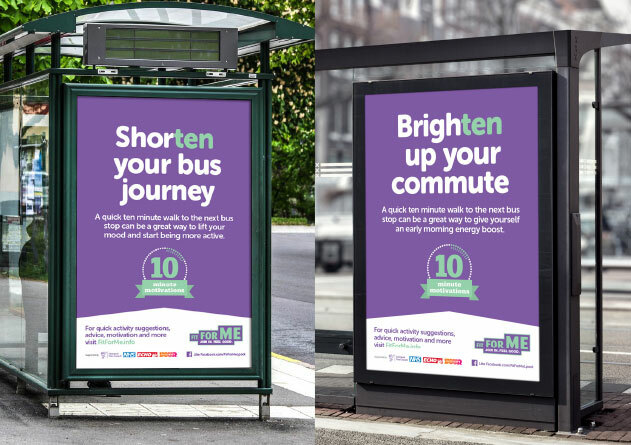 Following the successful launch of Fit For Me, Liverpool City Council asked us to produce a follow up campaign that focused on encouraging people across the city to try and add TEN minutes to their daily routine. We decided to create something simple, that our audience could immediately connect with. We achieved this by presenting clear propositions that would help convince our audience to make a small change to their everyday life, like getting off the bus one stop earlier or going for a short walk. Our approach was built around the idea that ‘starting with TEN can lead to a positive impact on your life’. So that’s exactly what we did, we started with the word ‘TEN’ and built positive, motivating headlines around it. We called these nudges and suggestions ‘Ten Minute Motivations’ and placed them around the city centre in strategic locations. This was then supported with press and digital advertising. The campaign was very well received around the city and on social media. It successfully gave Fit For Me a platform to deliver new messages to people within the city who may not have seen the launch campaign material.